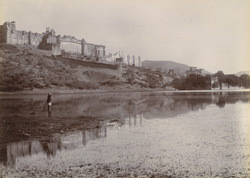 Photograph of Amber Palace near Jaipur viewed from the Maota Lake, taken c.1895 by the studio of G.W. Lawrie & Co. Construction of the palace was begun in 1600 by Man Singh I (r 1592-1615) and was added to in the seventeenth century by subsequent rulers. As with most Rajput palaces, it is asymmetrical in plan and elevation and fortified with ramparts and high, windowless walls. The walls are articulated at intervals with balconies and buttress towers surmounted by cupolas. Each of the four corners of the palace are emphasized by towers and the rectangular plan surrounds a large chowk. The Amber palace was built along a ridge of a hill overlooking the lake, making the east side, the one depicted here, appear as a unified front.